So it is time to start giving our visitors some teasers about what they can expect at The Designer Wedding Show. Apart from our brilliant selection of handpicked wedding experts and a stunning catwalk show produced by some seriously talented creatives we also are launching our Wedding Masterclass Series where visitors can get insight, advice and tips from some of our amazing experts…and ALL of this for €15?! Oh wait..you also receive a COMPLIMENTARY copy of the current issue Irish Brides Magazine AND Image Magazine..now that is one hot ticket!! Now you have your ticket you have to start planning your day so we are now delighted to announce the official show schedule. 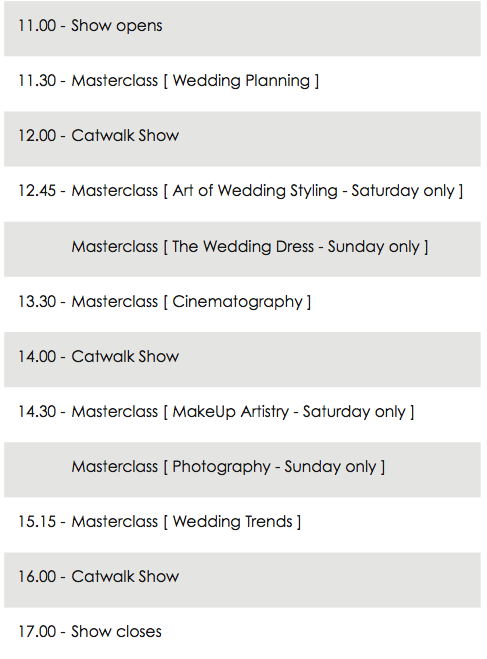 We will be elaborating more on both the Masterclass Series and the Catwalk Show so check back soon! Don’t forget we have complimentary carparking on site and the Royal Hospital Kilmainham is a short walk from Heuston station. For all travel details please see our visitors section. Tickets are available to buy online or by cash on the door on the day. We look forward to seeing you on the day and for up to the minute news please follow us on Twitter and like the show on Facebook.